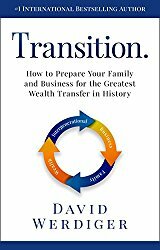 “Transition: How to Prepare Your Family and Business for the Greatest Wealth Transfer in History” by David Werdiger is a poignant work of invaluable guidance for owners and heirs of family businesses; it straddles the essential genres of Financial Advice, Family Business and Survivalist Manual. Successfully fusing personal narrative, academic data, original perspective, creative solutions, and practical takeaways for the fortunate reader, this is a must-read not only for family members involved in business transition, but for their advisors—accountants, lawyers, and even therapists. Author David Werdiger shares relevant experiences from his own life and personal journey, as well as his family’s private and business life, while leading the reader on a journey of discovery and exploration. He brings to this book a wide spectrum of experiences, extensive and varied education, as well as clarity of mind and words. His goal is to illuminate the challenges facing a family business, especially when approaching a generational transition, and then, provide solid methods and solutions for a successful transition. In our opinion, the author succeeded in delivering on that goal. In summary, “Transition: How to Prepare Your Family and Business for the Greatest Wealth Transfer in History” by David Werdiger is a concise yet thorough guide for all stakeholders in a family business who care to see it survive transition and thrive in its aftermath. The author successfully incorporates his personal experiences, vast knowledge, and gift for clear explanation of complex issues, delivering a highly readable and easily accessible guidance while emphasizing that a family business is, indeed, both a family and a business. This is a thorough and exemplary book that charts new grounds and provides a wealth of solid resources and wise advice. Highly recommended!